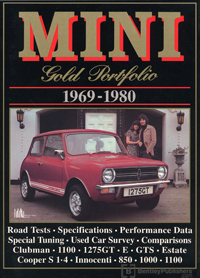 This Mini Gold Portolio: 1969-1980 is a collection of 45 original articles compiled from the pages of Australian Motor Manual, Autocar, Autosport, Car-South Africa, Cars & Car Conversions, Motor, Motor Manual, Motor Sport, and Wheels. The information collected in these reprinted articles includes 20 road and track tests, plus specifications, touring and long-term reports. The change to the new 'face' of the Mini in 1969 had removed some of the charm of the original car. But the Mini did need something to keep it looking fresh after 10 years in production. However, the customers liked it the way it was and the original style was reinstated at the beginning of the 1980s. Here is the story of the Mini in the 1970s by way of contemporary road and comparison tests, specification and technical data, new model introductions, racing, rallying, and conversions.